Winger Anthony Knockaert was accused of letting his Brighton & Hove Albion team-mates and supporters down by former England midfielder Danny Murphy on Match Of The Day. Knockaert saw red for a wild lunge on Bournemouth full-back Adam Smith in the Seagulls' 5-0 Premier League defeat. The incident came with Brighton trailing 2-0 and MOTD host Gary Lineker said: "I've seen some bad, nasty tackles in my time but this is a case of someone completely losing their marbles." Former England midfielder Murphy said: "Sometimes you try to have an understanding and I can't have any for this. It's dangerous and irresponsible and more importantly he's let everyone down. "Supporters were asking 'why'. At 2-0 you're still in the game. He's let his team-mates down and the supporters down. I'm sure he'll apologise but they've got some big games to come." Ex-England striker Ian Wright said: "Have they had some verbals or something? Has he said something? But even then he's launched himself at him. "I wouldn't say Bournemouth were absolutely ripping them to shreds then and Brighton may have got themselves back into the game." 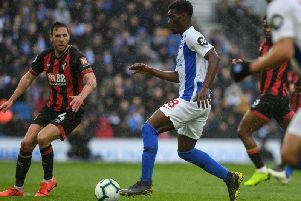 On the match, Wright said: "Brighton were poor and did contribute to Bournemouth's goals. "I'm very surprised by how poorly Brighton defended. Duffy and Dunk are two players I admire and they played really poorly but at the end of the day you can't take anything away from Bournemouth. "They absolutely tore them to shreds."